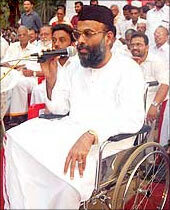 Abdul Nasser Madani, chairman of the Peoples Democratic Party, who is facing imminent arrest in the 2008 Bengaluru blast case claimed that the National Investigating Agency and the Intelligence Bureau have hatched a conspiracy to finish him off politically. Madani spoke to rediff.com's Arun Lakshman from Anwarassery in Kerala's Kollam district on Wednesday. Are you evading an imminent arrest ? I have never said that I will evade arrest. I am a law abiding citizen of this country and if the Karnataka police comes with an arrest warrant from the high court then I will comply with the law. I once again stress that I have highest regard for the judiciary. The Karnataka police's chargesheet states that you were part of a conspiracy hatched at Coorg and that (accused) Thadiyantavida Naseer said that you were present there. What is your take on this ? I have never been to Coorg. After I was released from Coimbatore central prison after eight years, I was accompanied by armed police guards. How can I go to Coorg without leaving any trace, while I am guarded by policemen round the clock ? I don't have any relation with people like Naseer. I had once shunted him out from Kollam. Ever since that incident, Nasser had acted like my enemy. An eyewitness says he saw you coming out of a car in Coorg. What do you have to say about this? I deny having ever visited Coorg. The witness, according to the chargesheet, has said that I was seen coming out of a car wearing a cap and that I am a bearded man without a leg. After my leg was amputed, I have never travelled in a car, all my travels are by van. I also suffer from chronic back pain and cannot sit up for long hours. My condition prevents me from alighting from a vehicle unaided. I have to be either carried out by someone or move around in a wheelchair. If I had used an artifical leg then how can the witness testify that I am a person without a leg. This proves that this is a fabricated witness and that there is a major conspiracy hatched by the investigating agencies to finish me. Whom do you blame as the major conspirator? The NIA and the IB have conspired to finish me off in a Karnataka jail. However as I had said earlier, I am a law abiding citizen and give full respect to the judiciary. I am not afraid of the police or the government but have full faith in judiciary and will comply with the arrest proceedings once the police comes with a warrant. Will your arrest create any communal problem in the state? I have already directed my cadres not to take law into their hands and I can guarantee that there will not be any law and order problem in the state if I am arrested. PDP leaders have said that you are suffering from various ailments and that you should be taken to a hospital. What is your current condition? I have high fever and cough. A sample has been sent to a medical lab for tests, to determine whether I am suffering from H1NI (Swine flu). I am a chronic diabetic and have problems with my back and suffer from a heart ailment. There are reports that you have terror links and that you have been the motivating force for all the youths who had taken to terror and terror-linked activities from South India. I have never supported terror activities and have never been an inspiration to any youth who had taken to terror. These are all conspiracies and half-baked lies which are being spread to finish me off politically in Kerala. I don't know what the future has in store for me, but I am an ardent believer of the supreme power and have the mental strength to overcome any obstacle. I can only say that I am a person who has strived for the upliftment of the downtrodden and the outcasts and for that I have had to pay a heavy price.